I've come across this funky little circuit board before but this was my first hands on and it was quite a delightful experience my dear! I was attending the Makey Makey workshop at the GalleryCamp14 Unconference at QUAD this year. Your connect it via USB to your computer then use wires ending in croc clips to connect the board to any electrically conductive object, and away you go. And I do mean ANY electrically conductive object. From bananas to pencil graphite to squidgy sweets and play dough, it all works fella. "You can even hook up a row of students and bang their bonces like a drum machine"
Dialup the makeymakey website and then got to the 'how to' section. You can control games and music making software and basically anything that requires a controller. The computer sees the board as a control input interface and this is why the magic happens - when you add software like Scratch you not only create your own game, you create how its controlled. 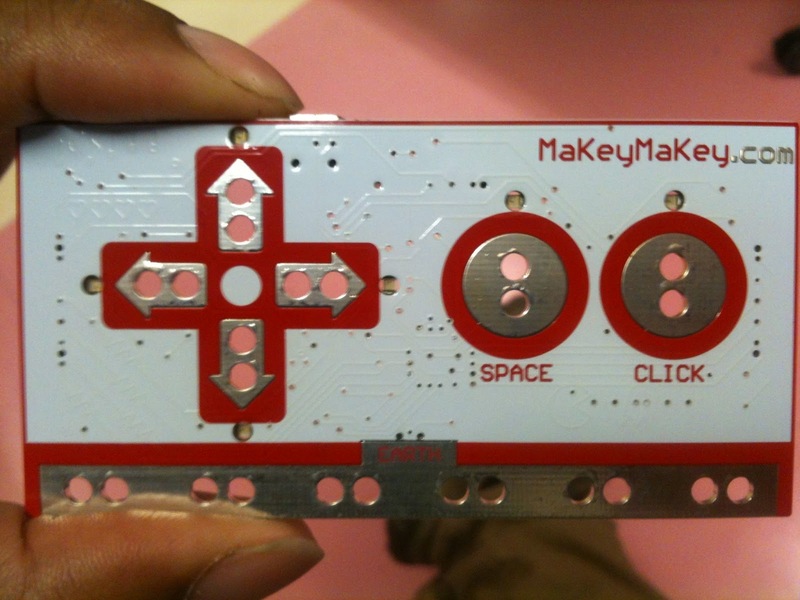 If you already know scratch you'll soon be up and running, jumping, shooting and banging in no time, just check out the tutorials abound on the Makey Makey website. £40 from Maplin. Bargain. Go play.